Indulge in decadent flavours and delicious pairings in this celebration of sensational gluten-free food and drink. These tasty bakes and savoury treats are all gluten free and have been chosen for their superior quality, taste and texture. This selection also includes a smooth, rich French Bordeaux wine. 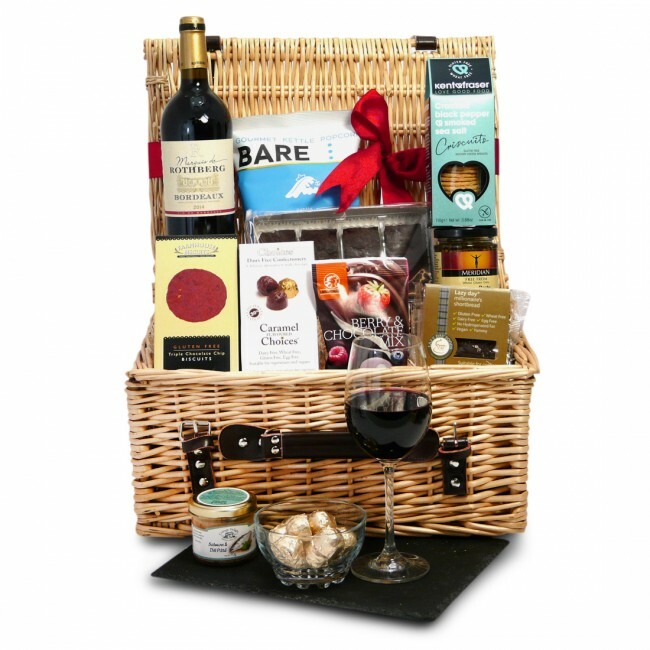 Hand-packed in an elegant wicker basket, decorated with a hand-tied red ribbon, it can be delivered to a door of your choosing with a personalised card. The gluten free food and drink in the Indulgence Hamper is carefully packed by hand in an elegant wicker basket. If substitutions are required, you will receive items that are the same (or higher) value and that will compliment your original selection.